We organise several tournaments throughout the year. 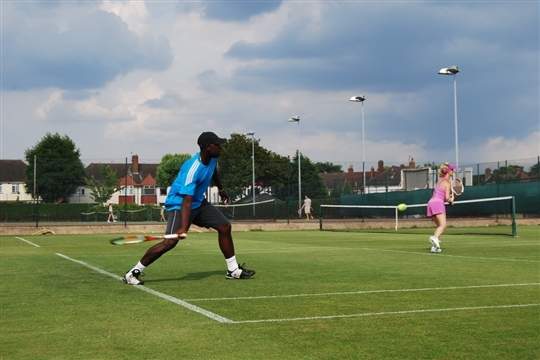 A men's and women’s singles, doubles, mixed doubles, and over 45's tournaments run over the summer. We also run a handicapped tournament from July to September each year. On every Bank Holiday Monday we run regular American-style tournaments. In addition there are tennis singles ladders to join so there is plenty of opportunity to compete and improve. We have six men's, four women’s teams and two mixed teams who compete regularly in the LTA Surrey Leagues. There is an opportunity to join the teams and receive coaching from the Head Coach, James Higgs, and his coaching team on Monday evenings from 7.30 - 9.30pm for ladies and Tuesdays evenings from 7.00 - 9.00pm for men. Several times a year we also get allocated time to train at the indoor tennis courts at the All England Lawn Tennis Club. Only team captains can book courts for weekend inter-club matches. Many of our players also compete in the LTA Postal tournaments.